We don't have to spell it out for you. 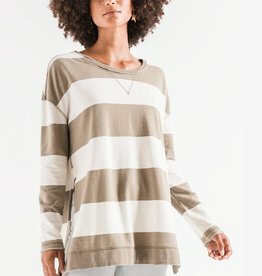 The Between The Lines is a perfectly drapey fine gauge striped sweater with a relaxed fit and loose sleeves. Just add boat. The Sail Away is a tape yarn striped crop sweater with the perfect cozy, boxy fit. A perfect light weight cardigan to pair with your favorite tee. This sweater knit top has an easy silhouette and undeniable comfort which makes this a win-win for anyone. With added features like a raw edge cut-out v-neck, vented sleeve cuffs and rib banded detailing. A new take on a classic favorite and best-seller! With burnout baby french terry fabric, high-low hem, exaggerated side slits, and triangle stitch at the neckline; you’ll want one in every color! The definition of cozy. 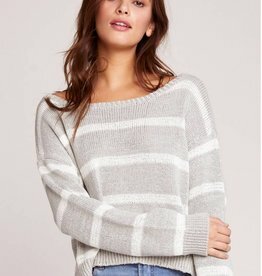 The Getting Warmer is a V-neck wide ribbed sweater with side slits and criss-cross back detailing. Come over. We've Got Cable. This is a soft and cozy ribbed pullover sweater with cable knit sleeve details. 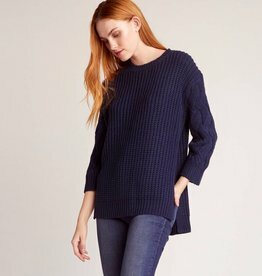 With dropped armholes and ribbed sleeves, this boatneck sweater is a tried and true shape for us and one of our favorites! 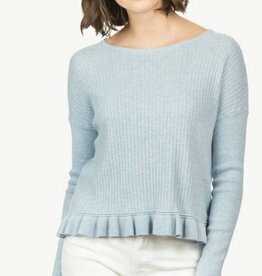 With a ruffled hem and novel stitch, this cotton and modal blend sweater is everything! Sequins are so hot right now. The Tis The Sequin top is a slinky pale gold sequin lurex sweater. It's good to be free. This long-sleeve cream tee features a Southwest-inspired graphics at the chest and back. Those satisfying sounds right before "cheers." Cashmere makes this long-sleeve, crew-neck pullover especially soft. Is your body a wonderland? Then do we have a top for you. 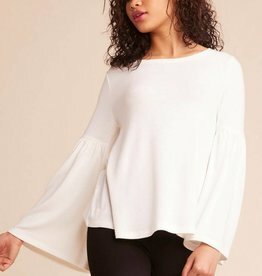 The Wonderland brushed knit top is ultra soft and drapey with flared sleeves.